At the end of our trip, we tried to make a list of our top 10 experiences. Instead we came up with two lists of “tops;” when we tried to come up with the tenth, we decided that there were too many competing for that tenth slot to complete the list. So here are our top nine, to complement the other top 11 experiences. 9. School visit in Kuala Pilah, Malaysia – We had no idea what kind of adventure we were in for when we decided to visit the site where Rebecca’s Dad had spent three years as a teacher in the Peace Corps in the 1960s. But we were in for quite a pleasant surprise. We learned a great deal about education in Malaysia, met some great teachers, and had more fun making teenage boys giggle than you can imagine. 8. Mama’s BBQ with Noah and Stephanie in Ko Lanta, Thailand – For half of our stay on the beautiful island of Ko Lanta in Thailand, Rebecca, her cousin, her cousin’s girlfriend and I ate at a BBQ joint we dubbed Mama’s after the charismatic, larger than life proprietor called Mama. 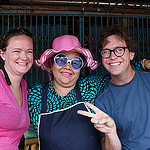 This large Thai woman had the biggest personality of the trip, and by far the best food. All of her four Thai classics – BBQ chicken, noodle soup, pad thai and green papaya salad – were absolutely delicious- but it will be her personality that we’ll never forget. 7. Motorbiking around Phonsavan, Laos with Pauline and Carole – It took some coaxing, but I finally decided to try out a motorbike excursion with the help of our French friends Pauline and Carole. I had never done it before, and I was faced with the prospect of carrying myself and Rebecca; not a simple task for a novice. But a few turns around the side street near the rental place and we were off exploring the Plain of Jars in Laos with two really cool new friends. And though the sites themselves were bizarre, it was one of the best days of our trip. 6. Seeing the orangutans in Borneo, Malaysia – Orangutans are an endangered species whose habitat is quickly disappearing due to deforestation and palm oil cultivation. So very few of them exist in the wild, and they are difficult to spot even by experienced guides. But our guide on our nature tour hit the jackpot on our trip, and we saw a mating pair of orangutans, one of them pregnant with the next generation. It was the coup de grace of nature spotting, and capped off an already awesome nature cruise. 5. Meeting Daniel and Thorsten in Cat Tien National Park, Vietnam – We love making new friends, and we made some great ones on our nature hike in Cat Tien National Park in Vietnam. The four of us laughed as we crouched and craned to see inane wildlife like jungle chickens, then delighted together in seeing crocodiles, greater hornbills, and macaques. We met up again with them in Hanoi and laughed our way around the city, hanging out as if we had known each other for years. It’s nice to find friends when you’re so far from home. We look forward to seeing our best German ones again soon. 4. Night dive in Pemuteran, Bali – This was our first ever night dive, and it was spectacular. Everywhere we shined our torches, we saw critters: flatworms spinning their way into the deep, octopi hiding in crevices, cleaner shrimp cleaning, humongous crabs, mandarin fish, and tons of other animals that you won’t see in the daylight. And the experience of being underwater at night is breathtaking: completely in the dark except for the bioluminescence around you and having to spin around so as not to smack into delicate coral. If you’ve never done a night dive, we cannot recommend it enough. 3. Luang Prabang, Laos – As soon as we arrived in Luang Prabang, we decided to extend our stay a few days. We couldn’t get enough. Great food, tremendous people-watching, and the most enchanting setting for a night market you can imagine make Luang Prabang simply stunning at night. And by day, there’s so much history and culture to take in that even ten days wasn’t enough. We just fell in love with it and can’t wait to go back to Laos in general for the friendly people and relaxed atmosphere. 2. Learning to dive in Koh Rong Saloem, Cambodia – In terms of pushing my limits, learning to dive was tops on this trip, since I was plagued early on with ear problems that threatened my ability to finish the open water course. But with the help of my awesome instructor Allie, I pushed through, and now I’m a bona fide underwater junkie. Allie and her colleagues at the Cambodian Dive Group made that experience – and the experience of being on an island without power and water for half the day – truly unforgettable. I’m so glad I persevered, because diving gives you a totally different perspective on the ocean. 1. Whale watching in Kaikoura, New Zealand – The whale watching in New Zealand is simply amazing. The island nation is home to one of the few deep water caverns in the entire world, making it one of the best places to see sperm whales. It’s such a popular spot that whale watching companies literally guarantee whale sightings to their customers with full refunds. And we hit the jackpot, seeing three sperm whales mere meters from our boat, and a whole pod of dolphins. For me, the highlight was the picture I got of the breaching whale, that iconic shot of the whale’s tail out of the water before it dives into the deep blue. That trip was a high that took us weeks to get over, so it takes our top spot. Darn it, now I want to get back on a plane! But alas, time to find something that pays the bills so we can go on our next adventure in the near future. ‘Til next time!